Jimmy P. is a character in WarioWare: Smooth Moves. 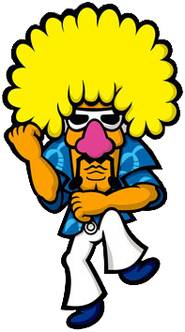 He plays a role similar to Jimmy T. and is designed after him, though he has a yellow afro, a pink nose, a blue shirt, white pants, and tanned skin. In contrast to Jimmy T., he doesn't go to Club Sugar at all, but instead a similar nightclub named Club Spice. Additionally, while Jimmy T.'s story features him befriending the Legendary Cat Dancers, Jimmy P. befriends the Legendary Dog Dancers. His background is never revealed either, and his family members and full last name are also never revealed. He bears a resemblance to the eponymous main character of the manga and anime Bobobo-bo Bo-bobo. Not counting Wario's alter-egos, Jimmy P. is the only character to have previously had a set of microgames in the WarioWare series to not be present at all in WarioWare Gold, though he does appear in a promo video. This page was last edited on November 17, 2018, at 08:23.